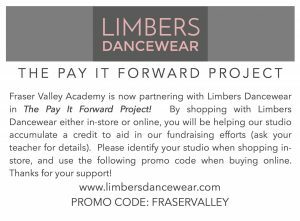 Fraser Valley Academy is now partnering with Limbers Dancewear in The Pay It Forward Project! Canadian retailer Limbers has created the Pay It Forward Project to help local schools. Please identify your studio when shopping in-store, and use the following promo code when buying online.